Finding it hard to pick the perfect business holiday e cards? Not sure which way to turn in a sea of snow and Christmas trees. Well you will be relieved to know that help is here! 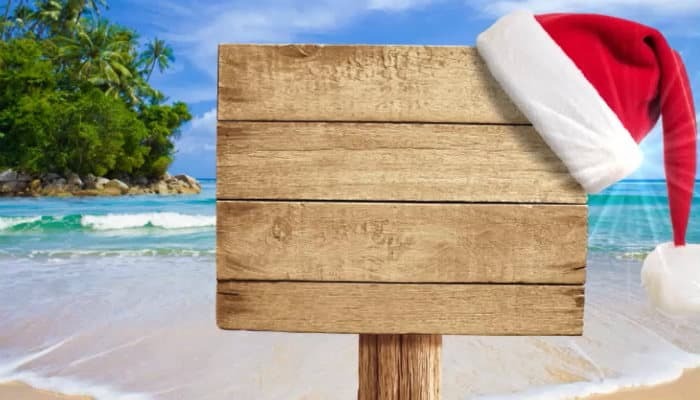 Don’t be stranded when it comes to contacting your customers to wish them a Happy Holiday, instead pick our Beached for the holiday electronic holiday cards for business and make a bold statement in the world of the festive cards. So what is so different about Beached for the holiday? Aside from a Santa hat, the cards themself do not offer the standard imagery that you would expect. In fact it takes a step in the other direction featuring a tropical scene that makes for an interesting take on the traditional holiday cards. Perhaps you have clients that are overseas and will be celebrating their Christmas in the sunshine? Or maybe you just want to make sure that your ecards stand out from the crowd? Whatever your reasoning you can be sure to bring a smile to their faces with the beached for the holiday ecards. Another fantastic part of our holiday ecards for business range is that we offer you the chance to not only customise the text inside the animated ecards but also place your own business logo on it too, adding your own brand identity to your Christmas communication; the perfect tool for any business.